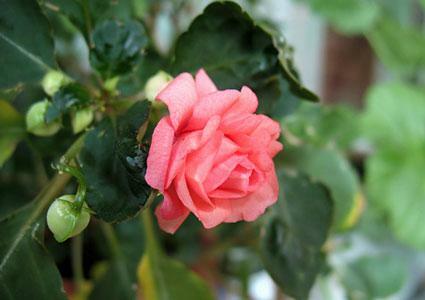 Balsam is an old-fashioned type of impatiens (Impatiens balsamina) that has regained popularity as an heirloom flower. It gives a shot of color to beds of summer annuals like nothing else and is generally immune to pests and disease. In Victorian England, balsam was all the rage, a recent import from Asia and adored for its exotic appearance. With their layers of soft velvety petals, the blossoms resemble small camellia flowers and the seed heads explode when fully ripe, just like other types of impatiens. The leaves are narrow, about four inches long, and oval-shaped with a pointed tip and a have lush, almost tropical looks. Balsam is an annual that can be grown in virtually any climate, though it thrives best where summers are not excessively hot or arid. 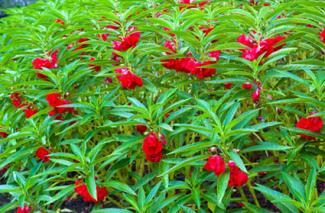 Balsam has the exotic flair of modern hybrid impatiens, but there is one big difference - it grows true from seed. Gardeners that grow hybrid flowers are reliant on buying their seed from the seed company each year, but seed from heirloom flowers like balsam can be collected, shared and planted again, year after year. If you want to collect the seed, place a plastic bag over the ripe seed heads, as they will explode and shoot the seed everywhere as you try to pick them. 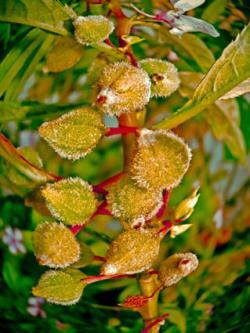 Balsam seed is extremely easy to germinate, but it best started indoors where it is warm. Sow it in flats directly on the surface of the seed mix about one month before the average date of last frost and do not cover, as they need light to germinate. Once the seedlings are a couple of inches tall, prick them out and transfer to small pots. Plant balsam seedlings directly in the beds where they are to grow once the soil has warmed and the chilly nights of early spring have passed. Planting soil should be loose and enriched with compost. 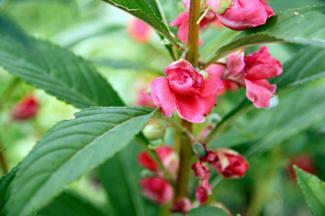 Balsam is surprisingly tolerant of both sun and shade, though it's best to avoid the extremes of either. In really hot climates, afternoon shade is best. In deep shade, balsam survives but looks leggy and bears few flowers. Regular moisture is important to keep the lush foliage of balsam looking its best. Growing about 16 to 20 inches tall on average on erect stalks, balsam is best planted in masses with low-lying plants in the foreground and taller species in the background. It is a traditional cottage garden plant and often seeds itself, making it a good candidate to combine with other self-seeders, like cosmos or lupine, for a colorful, half-wild display. 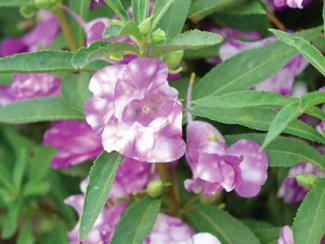 Bush mix is known for producing plants that look compact and full. Tom Thumb mix includes only dwarf varieties less than 10 inches tall. Blackberry Trifle has variegated purple and white blossoms. Balsam blooms almost non-stop from late spring through the first frost in colors that will make any gardener's head turn. However, they are surprisingly carefree, seeding themselves freely without spreading aggressively, making light work to create a beautiful flower border year after year.